Irvine, Calif. (May 2, 2011) – Lasher Motorsports Monster Energy Kawasaki’s Mike Lasher blasted across the Nevada desert in his Kawasaki Teryx™ to finish third in the Bilek Racing Silver State 300. Located 180-miles north of Las Vegas, Nev., near the town of Alamo, Round 2 for the UTV class of the Best in the Desert series proved to be a high-speed, action-packed race. The 305-mile course consisted of tough desert terrain packed with every type of obstacle imaginable. From wide-open fire roads to tight rocky mountain-trails, this diverse course even included two water crossings. Although the sky was clear and sunny, the weather was freezing cold the morning of race day, with temperatures below 40 degrees Fahrenheit. The demanding race’s combination of speed and jagged terrain would take out two of Lasher’s tires and a wheel, before the end of the race. After almost eight hours speeding through the desert, Lasher and his co-driver outran 13 other UTV teams to finish on the podium in third place. 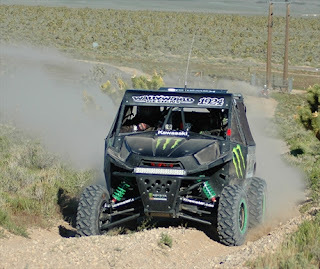 Since the last BITD event in Parker, Ariz., Lasher made some significant upgrades to his Kawasaki Teryx to ensure he would have the edge over the competition coming into the Silver State 300. Among the upgrades included a Muzzy-built motor, Billett King’s new rear-brake kit, EPI tuned clutches, PRP podium seats, and a fresh tuned XMF long-travel kit with Walker Evans shocks. The improvements paid off as Lasher finished the race in less than eight hours, despite having to repair two flats and a punctured wheel. At the half-way point of the race, Lasher handed over the wheel to co-driver Rick “Wally World” Wallace to finish out the race. Wallace took over the wheel in third place and rode a clean, fast race. He maintained the fast pace set by Lasher, and was making up ground when a rock punctured his wheel. After a quick wheel change he got back up to speed and crossed the finish in third place. Out of 220 total race entries, the Lasher Motorsports Monster Energy Kawasaki team finished the in the top 65. The UTV class blasted off the start at 7 a.m., followed by the trophy trucks who left the start at 9:30 a.m. Since the trophy trucks are bigger and faster than the vehicles in the UTV class, the UTV pilots set a goal of getting across the finish before being overtaken by the pack of thunderous trophy trucks. In two weeks, the Lasher Motorsports Monster Energy Kawasaki team will travel to Parker, Ariz., for Round 3 of the Best in the Desert series at the Epic Racing Bluewater Gran Prix. Lasher and co-driver Wallace will be looking to have a flat-free race so they can climb to the top of the podium.